We have a dream about buying more land. As many of the porridge ladies are renting houses we thought that a land purchase would allow us to build some houses for them. We’ll keep you updated. We need to keep the schooling and day care funding going, so the students can go on and graduate and the little ones can continue at the daycare centre. We need continuing support for the teacher and the 3 assistants at the day care centre, and would also like to provide medical care for the centre as well, this will cover not only the children but also the workers and the porridge ladies. We always need educational books, encyclopedias, atlas etc and vegetable seeds. 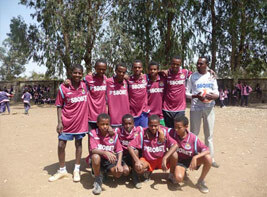 Once again this year we received football shirts for the school team. Last year we received a kind donation of Portsmouth shirts, this year we received 3 Southampton strips. It would be great to keep this going. The boys still love the football shirts that we take out each year. They are getting fussy and are asking for particular teams. One of the boys always asks for a Newcastle shirt. Many of you donated hand made jumpers and hats this year. These are always welcome as the nights can be chilly especially as many of the children have TB and or Malaria. A few costs broken down for you which we need to continue to fund each year (I have used the exchange rate of 17.07 Birr to £ (it was only 15.50 Birr in February). It is difficult to put into words how much your donations have changed people’s lives and how grateful the people are with the help you are providing. In these testing times it is getting tougher for them and we are finding how much harder it is to get funding. Thank you for your continuing support. We cannot change the world but together we are touching people’s lives and breaking the circle of poverty.